We're at the beach for the weekend but the forecast is not looking so good...so we may be cutting our weekend a bit short. Since it's September I thought I'd do a little reminiscing about August. I'm taking in these last, hot summer days and appreciating how wonderful it is to sit outside while the boys entertain themselves with the water table and water squirters and the hose. The other afternoon Reid was happily pouring water from one container to another and Carter was making up a game with dinosaurs on the rock wall and I thought--- oh how we're going to miss this in a few months when we're stuck inside. I'm also enjoying these last few years of Carter wearing what I want him to wear. I've been checking out all these back to school pics from elementary school and seeing the clothes these boys are wearing- our striped shorts and native days are coming to an end so I'm treasuring these cute outfits while I can! 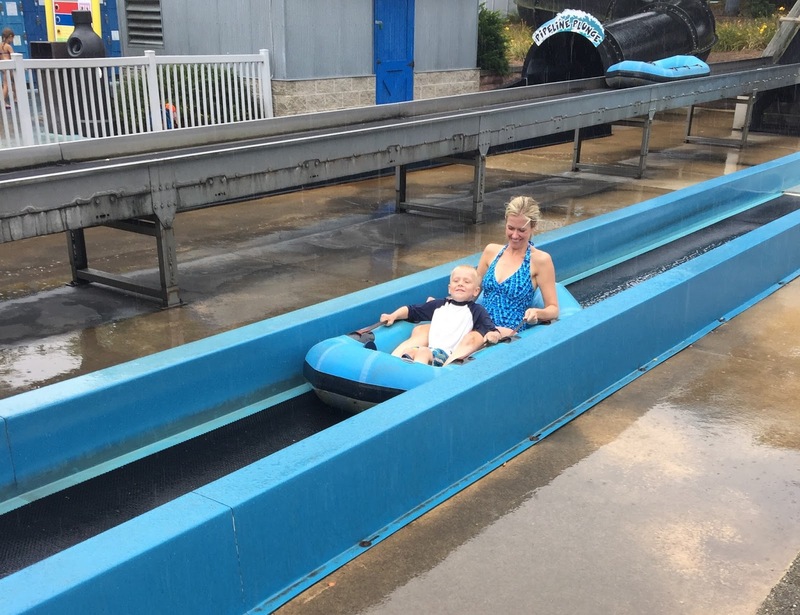 We spent many mornings at Dutch Wonderland in August with cousins and friends. Just this week he went on the swings for the first time and that's his new favorite ride! I also surprised Carter a few times after dinner and just he and I went to ride a few rides or go down the water slide (over and over with no line!) Those evenings were the best! We had a few cooler days when it wasn't 95 degrees and super humid so we played at playgrounds for the first time since May! We celebrated a bunch of friends' birthdays and we went to the Philadelphia zoo, the pool, and a splash pad too. This week their teachers came to meet us and next week we go to see the classrooms and then it's back to (pre)school! And although we had lots of summer fun I think I'm almost ready for cool mornings and apples and finally being able to wear my blardigan! I hope the weather gets better for you so you can enjoy the beach. I hear ya on enjoying the nice weather before winter. Love the splash pad photos. I'm ready for fall clothes. Bring it on!! Looks like August was a ton of fun! Hope your weekend was fabulous! Looks like August was full of fun for you guys! Can't wait to see what the fall brings.